There is a natural rhythm to my life as an artist, create and share, create and share, create and share. I create art that tells stories-therefore narrative work. Stories of faith, cross-cultural responses, coastal imagery, and roadside New England inspire art quilts, collages & handmade books. Designs are abstracted realism - simplified shapes, usually colorful though sometimes the theme calls for a somber palette. Sharing my art over the last twenty years, has been rich and unforgettable. More important than my artwork has been the people it has put me in touch with. At the invitation of faith-based workers I have traveled to Asia, Africa, South America, Europe & Australia to teach, exhibit, encourage, challenge and often most important, listen to very diverse people. Quilts, story ropes & collages are inviting, powerful story-tellers which invoke responses. The web section Journey highlights some of these experiences. 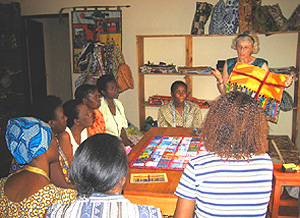 PHOTO Marge sharing the Rwanda quilts at the Christian sewing cooperative for marginalized women called Amani Ya Juu (peace with God) in Kigali, Rwanda. African fabrics used in HEALING TOGETHER and ALL TRIBES UNDER THE CROSS were fabric scraps from their workroom. Copyright 2019 Marge Malwitz. All rights reserved.